The long butterfly with calls is one of the major strategies that seasoned veterans use when trading options. The butterfly spread strategy entails combining a short and long call spread, with both spreads meeting on middle ground, strike price B. The basic idea is to let the calls at strike prices B and C expire when their worth diminishes, while at the same time capturing the value call with strike price A. 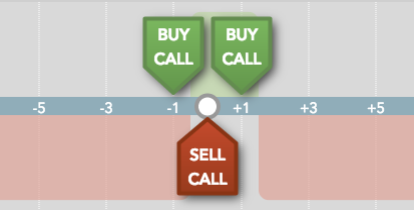 The main advantage of long butterfly spreads is that they are low-cost as you are auctioning off two calls at strike price B. the rewards to risk ratio is high and can be tempting, but as every option trading veteran knows, the chances of earning tremendous profits with this strategy are relatively low. To set up a long butterfly spread, the trader will first have to purchase a call at the strike price A. The trader should sell two call options at the strike price B, while also buying a call option at strike price C. All these events should happen concurrently in order to increase the profit range. The stock will usually lay at strike price B. The most important thing to note here is that all the call options will expire in the same month and that the strike prices are equidistant from one another. Seasoned veterans as well as the more advanced option traders are the most likely to run long butterfly spreads. They have the experience needed to handle trading three different options and managing the narrow profit range. There are two break-even points for the long butterfly spreads at expiration. The first one is at the point where strike price A combines with the net debit paid. The second break-even point is the point that results from subtracting the net debit paid from the strike price C.
The sweet point for this type of strategy is where the price of the underlying stock is at strike price B during the expiration of the option. The best time to employ this advanced strategy is when the trader does not speculate the underlying stock will move significantly within a set time frame. This implies that the trader anticipates that the magnitude of movement of his stock is fairly minimal. Most butterfly spreads work this way. The maximum potential loss is limited to the net debit paid while the maximum potential profit is calculated by subtracting strike price A from strike price B, and then subtracting the net debit paid from the result of the first calculation. The most ideal situation when employing the long butterfly spread strategy is for all the options to expire worthless except the option at strike price A. the price of the stock should be firmly rooted at strike price B. When it comes to this advanced strategy, most traders would prefer using their index options as opposed to their individual stocks. The reasoning behind this is the fact that index options are not known to be as volatile as the individual stocks.